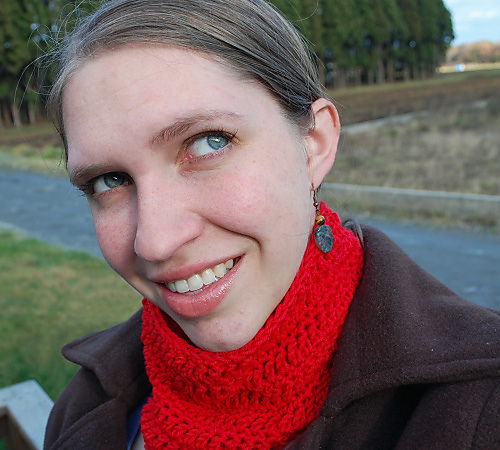 Second on the list of patterns being rescued from Crochet Uncut: the Simple Speedy Cowl. 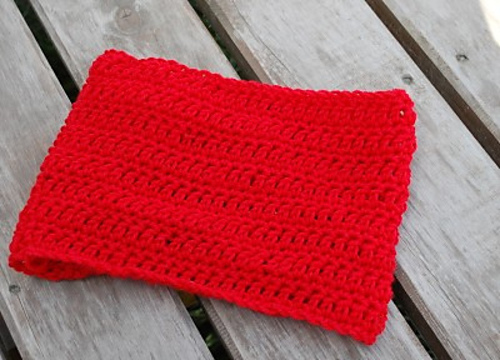 There’s not much that is more basic than a cowl – a simple tube of fabric, large enough to pull over your head and rest around your neck, cowls are a great way to use up a lonely stray ball of yarn, experiment with a new stitch pattern, or keep your hands busy during a movie. They’re so fast to make that they’re ideal last-minute gifts! This single-skein cowl is simple and speedy, with alternating bands of single and double crochet forming a subtly interesting texture that requires only bare attention from you to navigate successfully. Gauge: 11 sts x 10 rows = 4″ in patt. Gauge is not crucial in this pattern, and it can easily be adjusted to accommodate different yarn or hooks – just make sure that your starting chain can slip over your head! Rnds 4-11: Repeat rows 2 and 3. If additional width is desired, continue repeating rows 2 and 3, ending on row 3. Finishing: Using yarn needle, weave in ends.